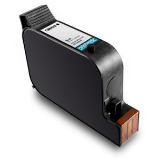 HP C9007A remanufactured Aqueous Black cartridge. Mailroom addressing black ink cartridge. For use in : Pitney Bowes DA400, DA500, DA50S, DA550, DA55S, DA700, DA70S, DA750, DA75S, DA80F, DA900, DA950, DA95F, W660, W680, W790, W990 and others.